Takeaway: Determining the value of your business is the starting point to building value. 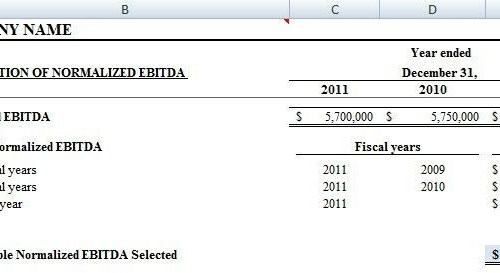 Here’s how to set up a simple valuation template in excel. Knowing the value of your company should be an integral part of the strategic planning process for all business owners. There are some instances when a formal valuation is appropriate, such as selling the business or buying out shareholders, but for planning purposes this valuation template in excel will do just fine. This template uses a market approach by looking at comparable public company and comparable transaction multiples. It will provide you with an estimate of the value of your business give or take 15 percent. If your company is growing or declining at a significant rate (greater than 10 percent year over year) than this approach might not be appropriate and a discounted cash flow approach would be more applicable. Click here if you would like to download the excel template. I am always amazed how many business owners don't know the EBITDA of their company. This is the most common metric used by buyers to assess the starting point for a valuation. To calculate EBITDA, take the net income from your company's financial statements for the last three years. As the acronym suggests, add back interest, taxes, depreciation and amortization from net income to calculate the company's EBITDA. Read our article on the Top 10 EBITDA Adjustment to Make Before Selling a Business to get an better sense of what can be added back or deducted in your template. Once the normalized EBITDA for the last three year has been calculated in step 2, you will have to select a level of EBITDA that you think will be maintainable by the company into the foreseeable future. The template calculates averages over the years but a lot of judgment comes into determining the appropriate level. Enter in your selected maintainable normalized EBITDA into cell E38 on the 'Normalized EBITDA' worksheet. You will need to find comparable public companies in your industry. Try to find at least five public companies that operate in a similar industry, region and provide similar services as your company. It would also be great if they were a similar size. It is difficult (if not impossible) to find an exact comparable that will match all of these criteria but do your best. EBITDA as at the most recent date. These variables can be found on most financial websites like Google Finance or Yahoo Finance. With these variables, we can determine enterprise value ((stock price x no. of outstanding shares) - cash + debt). From there we can calculate the implied valuation multiple: Enterprise Value / EBITDA. In our excel valuation template, this analysis is performed in cells A26:K37 in the 'Market Valuation' Worksheet. There are many services that compile transactional data but you will have to pay to perform a search. You can also get information on comparable transaction multiples from press releases or from the financial information of acquisitive public companies. Make sure that the multiples you find are EV/EBITDA multiples. Do not apply EV/Revenue or EV/EBIT multiples in this analysis because the answer you get will be incorrect. Comparable transactions should be in similar industries, regions and size range. They should also be quite recent; any transaction completed three years before performing this analysis might not be that relevant because valuation multiples could have increase or decreased due to market conditions. So now you have comparable valuation multiple from public companies and transactions. Use your judgment to select a range of multiples that are applicable to your company. In our template, we have calculated the harmonic mean to determine a high/low range of EV/EBITDA multiples. You might want to consider excluding big outliers when you are looking at an average. Before applying this multiple to your company, you might have to discount the multiple by 25% - 50% to account for the difference in a premium paid for larger companies. Again, judgment is needed to select the appropriate discount to apply to the multiples. Once you have selected the appropriate range of EV/EBITDA multiplies, apply them to your company's maintainable normalized EBITDA figure determined on the 'Normalized EBITDA' worksheet. This will provide you with an estimate of your company's enterprise value. Enterprise value is a metric for the entire value of your business but equity value will give you an understanding of how much you will walk away with when you sell your business. To calculate equity value you will have to deduct any long term debt outstanding in your business. This will include bank loans, amount owning to unrelated third parties or any other liabilities that would need to settled upon a sales of your business. You should also add back redundant assets or those assets that are not specifically needed by the business to generate earnings and cash flow from operations. Cash, real estate and personal assets held in the business are the most common redundant assets. Once you have completed your analysis, consider asking a business broker or investment banker out for lunch. Present your analysis to them and get their insight on your valuation range, other public companies that might be more comparable or recent transactions in your industry. I guarantee you will find lots of value in a lunch like this and will most likely not even have to pick up the tab. The primary purpose of this valuation exercise is to assess if the current value of your business meets your value expectation. Too many times, deals fall apart because owners have an unrealistic expectation of value. Use this excel valuation template regularly and well before you are planning to sell your business to determine if you are getting closer to reaching your goals.